This game, published for Squaresoft (Now SquareEnix due to the fusion with Enix) in the year 2000, quickly reached the top number of solds and number of fans due to it's awesome gameplay combining the Survival horror type with the RPG style. The game presents the facts that happen after the first game, and features Aya Brea, an agent from a government institute called M.I.S.T. that investigates artificial live forms. The city of Manhattan, involved in the discovering of these creatures, now its being attacked again, and now Aya Brea and its group will try to find the reasons why these creatures are appearing so suddenly, and growing stronger, leading them to a discover that could change the entire world. Now you can add videos, screenshots, or other images (cover scans, disc scans, etc.) 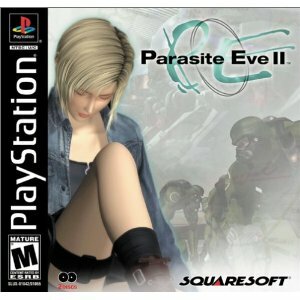 for Parasite Eve II (S) (Disc 1) to Emuparadise. Do it now!